Squint in babies, also called crossed eyes are a common eye disorder that occurs by birth or later in babies. It can be hereditary also. I am not going to explain in detail about the ophthalmological terms, since the basic awareness of squint is still lacking in our country. In the past decades, squint eye was considered a fortune; those with a squint eye will be rich and prosper. It may or may not be true. Scientifically, an untreated squint leads to reduction of vision and diminishes the vision completely at a point of time. But not to panic, there are always advanced treatments available. I can assure you since I started treatment for squint as early in 1989. Squint in medical terms is called Strabismus. You could have remembered playing this game in our childhood. We place a finger on the nose and try to look at the tip of the finger. Then we remove the finger and look funny with our misaligned eyes. That’s exactly what is called squint eyes. One or both the eyes do not align in the center of the eye ball, when pointed at a long distance object. #2. What causes the misalignment? The vision is taken to our brain through optic nerve. When the vision falls on the screen through the eye lenses, the image is read by the brain. In the case of squint, one or both the muscles become weaker or lazier than the other. Hence it causes a de-alignment when trying to form the image. The squint eye is therefore called a lazy eye. #3. What are the types of squint? Squint can be a permanent or intermittent occurrence depending on the disorder. There are ophthalmological terms to differentiate these two. In easy words, if the one eye is at the center and other eye is deviated, or both eye balls deviated from center at all the time, it is permanent occurrence. Any object they look into will form an image in the brain as twice the image, overlapping each other. Hence they can never differentiate the exact position of the placed object at any time. The intermittent occurrence is when both the eye balls are aligned properly at normal times, and when pointed out at a long distance object. For example looking at a lamp, one of the eye moves towards or away from the other eye ball, and forms the double image only at that point of time. The eye balls move back to normal alignment, when stopped to focus on the lamp. #4. How to identify the squint in babies? If there is a permanent squint, you can easily identify if the eye balls are deviated from each other at all times. All newborn babies will have a mild amount of alignment problems, this is because the eye starts to function, and the brain practices the art of reading the image. You can notice the intermittent squint in most babies below 6 months. This is quite normal, and it can vanish in 6 to 12 months of time. If it does not vanish in 12 months, and continues even after 2 years, then it is to be treated. The earlier a squint is identified, the better and easier is the cure. We can easily identify an intermittent squint, by viewing the child’s photo taken straight in front. That means they try to focus on the camera, which is kept at a distance, and if we can see the deviation in eye balls, then it is an intermittent squint. #5. How to test for squint in babies? If the child is too young to speak, and cannot explain you about the double vision, it’s not quite easy to test it at home. An ophthalmologist can do it in a clinic, where he covers one of the eyes and asks the kid to point at a light or object kept at a distance. Then he removes the cover in the eye and checks for any movement in the eye balls. He does it for both the eyes, and can identify the lazy eye. The eye which has the right muscle function is called a dominant eye and the squint eye is called the lazy eye. The lazy eye muscle tries to form the image with the help of the other eye, hence the movement happens. This is a very simple test, and no pain or discomfort for the kid at any time. There are many tests with toys that are designed to identify the squint in babies. This could be used for kids above 3 or 4 years, who can tell if they see a double object. #6. What are the treatments available for squint? Most permanent squints need a surgery, followed by usage of glasses, whereas the intermittent squint is mostly cured with glasses alone. The doctor can check for the amount of deviation and take the decision. In a surgery, the alignment of the eye is corrected by positioning the eye at the right place. And then followed by exercise of the lazy eye using the glasses. The basic idea of treatment is to make the lazy eye work. Hence the dominant eye is covered in a special designed glass, and the lazy eye is forced to form the image on its own. So the lazy eye practices to work on its own and does not rely on the dominant eye any more to form the image. Once the amount of deviation and vision improves in the lazy eye, the dominant eye is allowed to view, but with different power for the glasses, thereby giving continuous exercise for the lazy eye in a minor level. The doctors prefer to use the glasses permanently, because a squint can revert back slowly if the glasses are ignored. #7. Which hospitals you can prefer for testing squint in babies and kids? You can take your child to a normal eye clinic at the first stage to identify. And then you can prefer bigger hospital, where pediatric ophthalmology is available. I was treated at the Sankara Nethralaya, when squint specialists were a rare at that time. Nowadays, most popular eye hospitals have the pediatric eye specialists as well as squint specialists. If your child is above 2 years, never ignore if you have a doubt on the eye movement or deviation, since it is always better to clear the doubt than being ignorant of the problem. 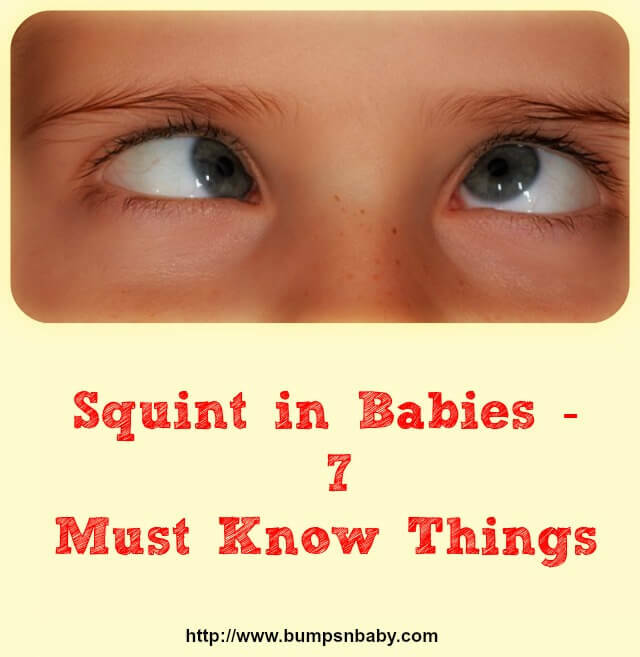 Hope this article of squint in babies was informative. Kindly help to spread a word about this article by sharing in your Facebook and Twitter. Durga is a software professional turned home maker, currently living in Germany, with husband and almost 4 year old son Jayadev. She wants to share every bit of parenting ideas that is being gathered over the mom-years for the benefit of new parents. Information provided by you was very useful. My baby boy age 1 year 2 months is having acute squint in left eye. Am not sure he’s having or not as sometimes we finds both his eye normal and sometimes we find that his left eye is slightly tilted towards his nose. We consulted few doctors of ASG & even AIIMS they have given Atropine ointment to be applied 3-4 days, them they will confirm about exact situation. I was so depressed initially when I came to know. I just want to know from your side that if it’s treated in this age it can be cured 100% or it will remain throughout his life. Hi Durga. I thought you would be able to guide and advise us regarding squint eye. My grand daughter is 9 months old and we were told that she had a squint eye. She stays in New Zealand. I have seen babies squint in their early years but overcome the same with age, but here she is still squinting occasionally and we are worried. Please advise. Her squint was not obvious at birth. She seemed to have normal eyes and vision. As you said many are still ignorant about eye problems, even my father was not serious until I was 4 plus. Later my Aunt was the one who alerted us of the complete vision loss if we neglect squint. Parents should also think of the cosmetic issues, which children face very early from school nowadays. I would recommend that parents do a yearly eye checkup for kids at a certified pediatric ophthalmologist to identify squint eye and all other eye related problems. Many people I know suffer from vision problems. For most of them treatment would have been successful if they were identified at an early age. But unfortunately most them identified them only when the situation got worse.